Debate • Seven GOP candidates agree on strategy, differ on tactics. Trent Nelson | The Salt Lake Tribune State Central Committee members look on via videoconference as Attorney General candidates Brian Tarbet, Bret Rawson, Sean Reyes and Michelle Mumford participate in their only debate before the Saturday special election by the State Central Committee. The committee sends the top three to the governor who chooses the new Attorney General to serve until after the Nov. 2014 election. Wednesday December 11, 2013 in Salt Lake City. The seven Republican candidates to replace former Attorney General John Swallow made their cases Wednesday evening why they are best equipped to restore public trust after an 11-month-long scandal that rocked the office. They disagreed, however, on whether it would be better for the office to have an attorney general who would step in for a year, focused on righting the ship and not seeking election in 2014, or a leader at the helm committed to winning election and providing longer-term stability. 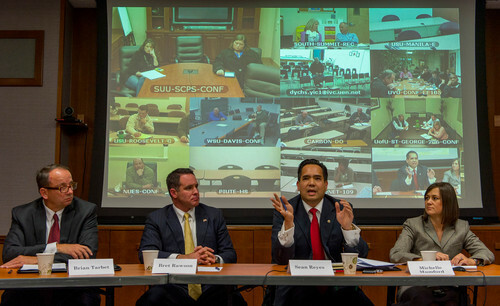 Sean Reyes, who lost to Swallow in the Republican primary last year, argued that if an interim attorney general is chosen and someone else steps in after the 2014 election, it would be disruptive to have had three people lead the office in such a short period of time. Bret Rawson, a defense attorney and reserve police officer, agreed, saying that in a business such rapid turnover would devastate morale. And Michelle Mumford, an assistant dean at the Brigham Young University law school, said the office needs leadership and stability. "These decisions need to be made now by somebody the office can rely on and rely that that person will still be there and everything won&apos;t change again in a year," Mumford said. But Michael Wilkins, a former Utah Supreme Court justice who has committed not to run for election, said the focus needs to be entirely on fixing what is wrong in the office, and Brian Tarbet, the acting attorney general, agreed. Tarbet said his bid to replace Swallow has been time-consuming, and the office needs 24-seven attention. Tarbet, who served as Swallow&apos;s general counsel since January, said he has the advantage of knowing how the office works and what needs to be done. Scott Burns, a former White House deputy drug czar and county attorney, didn&apos;t rule out seeking election, while Robert Smith, managing director of the International Center for Law and Religion Studies at BYU, said elections are a "blessing of democracy" and that it matters more how candidates campaign than whether they do. Tarbet also found himself on the defensive as the contenders sought to tie him to the nearly yearlong scandal that engulfed the office. Mumford took Tarbet to task, though not by name, for failing to issue a "litigation hold"  an order directing attorneys and staff to keep all their documents  until September, after Swallow had already been under investigation for months. "With all due respect to the current administration, there was no litigation hold sent until [September]. There are seven missing devices," she said. "For those people who were in the office who didn&apos;t know what was going on, there is a competency issue." Tarbet responded that "the concern about a cover-up is well-placed," but the office has turned over more than 28,000 documents to investigators. "We&apos;ve tried to be as open and transparent as possible," he said. Smith said he appreciated Tarbet&apos;s commitment to transparency but added, "I think it&apos;s important that there be a new leader in the office that can have the trust of the people to begin to create the credibility and honest environment that is needed." Burns, meantime, criticized entanglements that Rawson and Mumford had with Swallow&apos;s accusers. Rawson is on the defense team for Marc Sessions Jenson, who accused Swallow and his predecessor, Mark Shurtleff, of extorting gifts and favors; Mumford&apos;s husband represents Jenson, as well as the business partner of Jeremy Johnson, whose allegations sparked the scandal. "We don&apos;t need anyone who is anywhere near associated with any of this mess," said Burns. "It&apos;s time for somebody who doesn&apos;t know these people, has no involvement, hasn&apos;t been seen with them, hasn&apos;t represented them." Rawson said afterward his work for Jenson was in defense of someone who had been a victim of the system. "When you fight against evil, it doesn&apos;t connect you to evil," said Rawson after the debate, adding that it goes to his philosophy of protecting the downtrodden. The 181-member Utah Republican State Central Committee will meet Saturday and choose three names to send to Gov. Gary Herbert, who will pick the next attorney general from the three. The replacement&apos;s term will run until the attorney general elected in November 2014 takes office. There was broad agreement among the candidates on policy issues. All committed that, as attorney general, they would push for Congress to turn over federal land to Utah. Wilkins said a Utah law demanding the transfer is constitutionally defensible, Mumford said it is ripe for action, and Rawson said the state should take action immediately. "At the end of the day, we have to stand up and act like a sovereign," Rawson said. "We have to file the lawsuit, we have to file it now." The candidates also committed to defending Utah&apos;s Amendment 3, which says marriage in Utah can be between only a man and a woman. That amendment is now the subject of a challenge in federal court over whether it is discriminatory against gay couples and unconstitutional. Mumford said that the lawsuit gave Utah an opportunity to be on the forefront of defending traditional marriage and it was unfortunate that, because of the turmoil in the attorney general&apos;s office, the state was not represented. Tarbet countered, however, that the state was represented and attorneys in the office spent three days in mock court exercises preparing for the arguments. "Regardless of what happens with [the federal court case], we&apos;re going to move forward based on protecting the will of the people as passed in Amendment 3," Tarbet said. Smith said traditional values are being threatened and it is time for the state to defend them. Wilkins noted that the state constitution normally trumps a law and said he would make the argument in court that the state should have the authority to define marriage as it sees fit.